Kegel strengthening never felt so good.Ben Wa Balls. The colorful floral design is soft and wonderful, the sensations you will experience are intense and powerful.Beginners simply insert these Ben Wa pleasure balls, exercising their way to a tighter, more youthful sexual experience. Experts can experience their pleasure all day long anywhere, anyplace and can uncover a whole new realm of sexual pleasures. 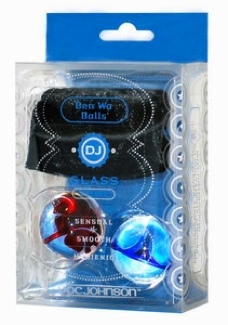 We have included a beautiful velvet carrying bag so you may always keep these pleasure balls with you. You never know when the mood will strike. Kegels, or PC muscle exercises, are the easiest way to ensure and maintain your sexual health. Strengthening your pubococcygeus muscle, your pelvic floor muscle, makes for more intense orgasms, more sexual control, better urinary control, firmer erections and better prostate tone.